In the throes of an identity crisis and scrambling to recover ground lost in 2016, Democrats tried a wide array of tactics in this year’s midterm elections. Some tacked left, others tacked right. Both strategies yielded mixed results. But the major difference between the two approaches is that the Democrats who parroted conservative talking points ceded politically to the Right, even when they won their elections. Those who articulated a bold progressive political vision claimed a crucial victory for the Left, even when they appeared to go home empty-handed. When Democrats compromise on left-wing values to win office, that’s a draw for the Left at best. This is because the task of the Left in the political sphere isn’t simply to prevent Republicans from gaining majorities — it’s to defeat the right-wing agenda, in all its forms. If that’s your goal, incorporating conservative positions and rhetoric into your own campaign is an unsound strategy, destined to undermine you in the long run. Donnelly lost. Even with an incumbent’s advantage and the ringing endorsement of Barack Obama, who visited Indiana for a last-minute rally with the senator, he was unseated by Republican challenger and Trump acolyte Mike Braun. Braun is an aggressively pro-corporate multi-millionaire businessman and free-market evangelist who exploited a man’s death against his widow’s wishes in a campaign ad designed to spread fear about undocumented immigrants. Sanders did something even more important than defeating his opponent on the political stage: he gave millions of people permission to take their innate disgust with economic inequality and exploitation seriously as a political framework. There are two main reasons to be leery of Donnelly’s approach. First, it doesn’t work. When Democrats tack to the right — often on economic issues, less often on social ones — they justify it as a shrewd stratagem, even a prerequisite for victory. But the idea that Democrats stand a better chance at winning office if they posture as Republican-lite is baseless. Ordinary people, whose living standards are declining as their wages stagnate and their safety net disappears, are increasingly attracted to distinct and explicit political agendas and proposals for bold change. So when a Republican puts forth a brazen (if dystopian) vision of the future, and a Democrat responds by proposing a watered-down version of it, the Republican has the advantage. This is clearly what happened in Donnelly’s case. It’s also the reason that arch-centrist Hillary Clinton lost to Donald Trump, and why Bernie Sanders beat Hillary Clinton in Indiana. Second, politics isn’t just about whether a candidate wins. It’s also about how they win, and on whose terms. Elections are a unique opportunity to speak to people on a mass scale about the principles and values that should order society. Political candidates have a chance to say whatever they want to thousands and sometimes millions of people at a time. The choices they make about how to wield that power shape the popular conception of what ideas are admissible, what policies are desirable, and what social transformations are achievable. Political campaigns are always either expanding or constricting the imagination of the public. For a candidate whose sense of political purpose extends beyond selfish careerism — someone who wants not simply to improve their personal station, but for their political ideas to become ascendant in the long-term — a campaign is an opportunity to educate and inspire constituents with a positive, unambiguous plan for a better society. When a Republican like Braun stokes the fires of xenophobia and racism, and a Democrat like Donnelly responds by reiterating his support for a border wall to keep immigrants out — promising that he won’t let the “[menacing voiceover] radical left” abolish ICE and asserting that we must do “whatever’s necessary to protect our border” — this entrenches rather than challenges the conservative worldview. It’s a political victory for the Right, no matter who wins office. Similarly, when a Republican calls for “market-driven health care solutions” as part of a larger program to pad corporate pockets at the expense of working people’s health, and a Democrat responds by aiming his indignation at the segments of the Left seeking to attain universal public healthcare, the Democrat has thrown the match. He’s wasted his opportunity to lay the groundwork for long-term left-wing victory by proposing an alternative to the right-wing capitalist vision of a world where people are subordinate to profits. Winning on those terms is far from guaranteed — and it’s hardly a victory at all. Donnelly’s a somewhat extreme example, at least on social issues. Though many Democrats agree with him on the need to cater to large businesses and the impermissibility of Medicare for All, most are pro-choice and oppose Trump’s border wall. But Donnelly’s strategy is not as anomalous in the Democratic Party as you might think. Politics isn’t just about whether a candidate wins. It’s also about how they win, and on whose terms. Thus we saw how the Democratic Party establishment is fully on board with this strategy of swapping political conviction for what they assumed would be partisan victory. Mostly this manifests as a fetishization of compromise. The Democrats recovered a majority in the House yesterday. Instead of taking the occasion to claim a victory for the Left over the Right, Nancy Pelosi promised that Congress would now function as a “bipartisan marketplace of ideas.” Even in their wildest political fantasies, basking in the glow of victory, Democrats see themselves sharing governing power with Republicans rather than defeating Republicans’ ideas. This obsession with combining left and right politics, instead of simply pushing against the Right from the left, is the same strategy that for more than thirty years has kept Democrats busy mastering the art of compromise while Republicans pursue their high-octane austerity, privatization, and reactionary social agenda without any pretense to bipartisanship. Not only is it pathetic to behold, but the payoff is supposed to be electoral victory. That victory has been elusive. Meanwhile, concessionary centrism from the Left matched by zealous ambition from the Right have combined to produce a rightward drift in American policy, especially as pertains to corporate empowerment and evisceration of the public sector. But there is a split widening within the Democratic Party, and not every candidate in the midterms struck a centrist pose. Quite a few Democrats tacked left instead, contra Obama and Pelosi. Candidates have changed their tune because the national conversation has shifted dramatically — and that’s happened because Bernie Sanders has a different conception of the political value of an electoral campaign than mainstream Democrats do. In 2016, when he went head-to-head with Clinton in the Democratic Party primary, his goal was not to simply beat his opponent by whatever means necessary — though, tellingly, he did come much closer to winning than anyone expected, given that party elites reviled and actively restrained him. Instead he acted like a candidate acts when they have a clear political vision, and their goal is to popularize that vision and inspire a new constituency that will fight for that vision for years to come. To this end, Sanders put forward a bold platform that tested the limits of what Americans thought was possible, while remaining achievable on the condition that Americans could muster the political will. He unflinchingly campaigned on ideas that would transform working people’s lives but that few Democrats had the guts to publicly propose, including Medicare for All to tuition-free college and student-debt forgiveness. Putting this platform before a mass audience not only established new norms of legitimacy in the political mainstream — it also worked to rewrite the narrative about the balance of power in American society. Sanders’ platform told a story about America with a new protagonist, the non-affluent majority, and a new antagonist, the ruling-class minority that profits from everyone else’s hard work and desperation. As a result, even though he lost the primary election, Sanders emerged over the next two years as the most well-liked politician in America. Popular support for Medicare for All shot up from 21 percent in 2014 to a whopping 70 percent this year. Popular support for tuition-free public university reached 60 percent, up from an idea so obscure that pollsters didn’t even inquire about it. By treating his campaign as an opportunity to reset the terms of the debate and raise the expectations of the ordinary people who comprise the broad working class, Sanders did something even more important and long-lasting than defeating his opponent on the political stage: he gave millions of people permission to take their innate disgust with economic inequality and exploitation seriously as a political framework. A majority of Americans now want to eliminate the private insurance industry and replace it with a single public alternative, and more than half of Democratic congressional candidates ran on the issue this November. 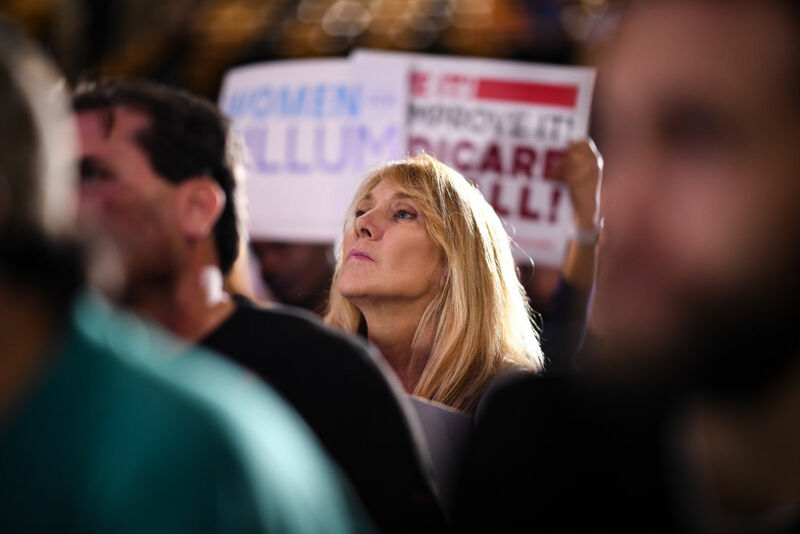 Candidates who backed Medicare for All and other progressive policies sustained a combination of defeats and victories. But they had in common a willingness to walk through the door that Sanders opened and use their campaigns to raise ordinary people’s expectations for what a good society can look like. In an era dominated by unhinged Republicans and equivocating Democrats, running a widely observed campaign aimed at generalizing progressive and democratic socialist principles is a victory for the Left, whether or not the candidate defeats their opponent. When the Left runs as the Right and it loses, as Donnelly did, that’s a double loss. When the Left runs as the Left and it wins, as Alexandria Ocasio-Cortez, Julia Salazar, and Franklin Bynum did this midterm season, that’s a double victory. And even when explicitly left-wing candidates don’t win office, their losses aren’t complete if they’ve dedicated their campaigns to articulating and popularizing progressive and democratic-socialist ideas on a mass scale. Let’s build more of those kinds of campaigns, instead of insisting on losing twice.